Monster Energy made a big splash for the 2017 season, signing on as the entitlement partner for NASCAR’s premier series – the Monster Energy NASCAR Cup Series. The global brand that’s built on excitement and enthusiasm ushered in a new era of at-track entertainment for fans, featuring attractions such as freestyle motocross exhibitions, the Ball of Steel and the Monster Girls. NASCAR enhanced the on-track product starting in 2017 with the introduction of stage racing, which ensures more highlight-reel moments during a race, increases the sense of urgency and emphasizes aggressive racing and strategy. The battle on track also extends to Chevrolet, Ford and Toyota – who have reached a level of parity that all but guarantees the fight for the manufacturer championship will come down to the very end of the season. 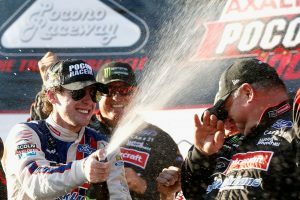 The future stars of NASCAR are taking over the spotlight today as drivers such as Kyle Larson, Chase Elliott, Ryan Blaney, Austin Dillon, Daniel Suárez and Erik Jones are challenging for – and winning – races every weekend. They battle established superstars like seven-time champion Jimmie Johnson, Kyle Busch, Brad Keselowski and Joey Logano, who continue to build their own legacies. With developmental series in Mexico (NASCAR PEAK Mexico Series), Canada (NASCAR Pinty’s Series) and across Europe (NASCAR Whelen Euro Series), NASCAR’s global reach is felt far and wide. Most recently, Daniel Suárez (Mexico) and Alon Day (Israel) joined the ranks of Monster Energy NASCAR Cup Series drivers who got their start in NASCAR’s international circuits. The NASCAR family also includes Iowa Speedway, just outside of Des Moines. The “Fastest Short Track on the Planet” hosts three major race weekends a year, welcoming the NASCAR XFINITY Series, NASCAR Camping World Truck Series and IndyCar for thrilling races. 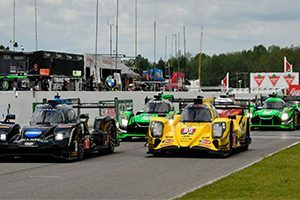 Exotic cars, international stars and premier road course and street circuits define the IMSA WeatherTech SportsCar Championship, the top level of sports car competition in North America. More than 15 manufacturers and championship drivers from NASCAR, open-wheel and international sports car competition compete for the top step on the podium at prestigious endurance events such as the Rolex 24 At Daytona, Mobil 1 Twelve Hours of Sebring, Sahlen’s Six Hours of The Glen and Motul Petit Le Mans.